Back in January we looked ahead to some conferences taking place in early 2012. Spring is now upon us and we are entering an extremely busy period for Nonlinear in terms of events. At the last count we have 12 conferences lined up over the next 3 months, all in different parts of the world. The meetings we attend range from small society meetings, with a few hundred attendees, to large international conferences attracting many thousands of delegates. 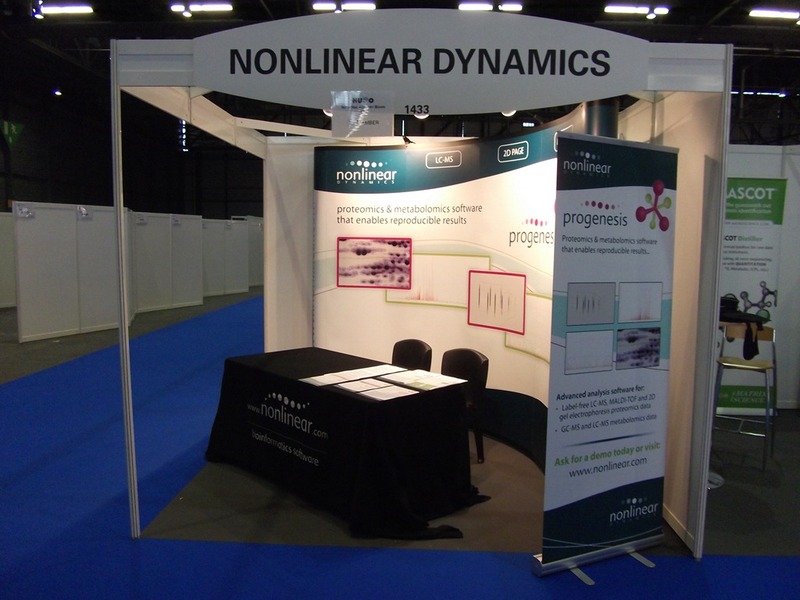 We get a lot out of both types of event, we can meet existing customers, keep abreast of the latest advances in proteomics and metabolomics, learn about new applications and of course show Progenesis to potential new customers. The full Progenesis range can be seen at our booth. We can show you the workflow on some demo data, or you can pre-arrange to bring some of your own data if you would prefer. If you’re interested in metabolomics, the Progenesis CoMet v2.0 Beta (not yet available to download from the website) will be on show – so its a great opportunity to see the latest developments. See our full list of events on our website. Starting this weekend in San Diego, EB2012 is a multidisciplinary meeting which attracts nearly 14,000 scientists, represents six sponsoring societies and 30 guest societies. It is an excellent opportunity to meet with scientists from a wide range of research areas who do proteomics or metabolomics as part of their work. You get to talk to literally hundreds of scientists, so we’re looking forward to it! Following hot on the heels of EB2012, we have the AOCS meeting (April 29th) which is being held in Long Beach, CA. It’s the first time we’ve been to this meeting which brings together over 1,600 researchers. We hope to meet scientists who are interested in Progenesis CoMet and Progenesis LC-MS for lipidomics, small molecule research and AOCS members who are doing proteomics. The meeting of the Asia Pacific and Oceania branch of HUPO is taking place in Beijing, starting on May 5th. We are attending with our Chinese distributor, Cloud Scientific Technology who have been selling the Progenesis software for 3 years and are based in Shanghai. This talk will introduce the challenges of running proteomics experiments and the practical steps that can be taken to help overcome the challenges of reproducibility. It will present the results obtained applying these techniques in a urology clinic. I hope you can make it to Will’s talk. This year, starting on May 20th, ASMS is being held in Vancouver, Canada and promises to be a big event for Nonlinear. The meeting attracts more than 6,500 scientists and nearly 3,000 papers are presented as posters and talks. We’re looking forward to catching up with some of our Progenesis customers and seeing some of their work presented during the course of the meeting. ASMS provides an excellent opportunity to see the latest MS technology, and much more, as many instrument vendors take up hospitality suites which are open after the exhibit hall closes. It can be a punishing schedule – thank goodness it only happens once a year! We hope that you can join us at one of these meeting. Keep an eye on the blog as I’ll update you on some of the summer meetings. Maybe we’re attending one close to you? This entry was written by Beth McArdle, posted on April 20, 2012 at 1:13 pm, filed under April 2012 and tagged Conferences. Bookmark the permalink. Follow any comments here with the RSS feed for this post. Post a comment or leave a trackback: Trackback URL. You should use cation when running with urology clinical trials. I was careful who I decided to seek advice from when I discovered I had a hernia.